A central theme this week seemed to be creating a better future and, if necessary, fighting for it. For instance, how can cities like Encinitas combat climate change? But the necessary cures are tangible, expensive and politically difficult, like building mass transit, miles of dedicated bike lanes or establishing alternative energy providers. The process of creating and monitoring the city’s Climate Action Plan can seem overly focused on the technicalities when the hard work comes with doing actual projects. I’ll admit that I’m less interested in understanding all the technicalities and more focused on the nuts and bolts of the projects needed to address climate change in Encinitas. At this week’s Council meeting, we heard about progress on the effort to update our 2011 Climate Action Plan. We’re expecting to publish our draft 2017 Climate Action Plan in June and then begin the needed environmental review. I feel that we’ve fallen short on implementation of the 2011 plan. The category of “transportation” accounts for 70 percent of our emissions, but we haven’t been as dedicated as we could be in creating alternatives to fossil-fuel transport. For example, our city’s Bicycle Master Plan, which is over 10 years old, is apparently still only 10 percent complete. We have no transit to our community college, Mira Costa, which serves thousands of students daily. Busing in elementary schools has been eliminated in school districts due to the costs. In an overall positive meeting, City Manager Karen Brust reassured us that she’s working on implementing the many mobility plans that we’ve already completed, including most recently a Safe Routes to School plan. While acknowledging that we have room for improvement, residents and the city have made progress in Encinitas to reduce our carbon footprint, including many homes and government buildings with solar panels, more electric and hybrid vehicles, greener buildings, increased use of recycled water and countless other things. I’m glad we had the chance to discuss the Climate Action Plan as a Council and I’m hopeful that the next time it comes up, specific projects that put us on target to meet our emissions goals will be presented. Progress on designing Leucadia’s future continues. The environmental review period for the Leucadia Streetscape project — a traffic calming, pedestrian and bicycle-oriented project (relevant to the Climate Action Plan above!) – is now closed and the comments are being evaluated. Here’s an incisive commentary about Streetscape by Darius Degher, a longtime Encinitas resident. Everyone has a voice, and this weekend we chose to use ours. 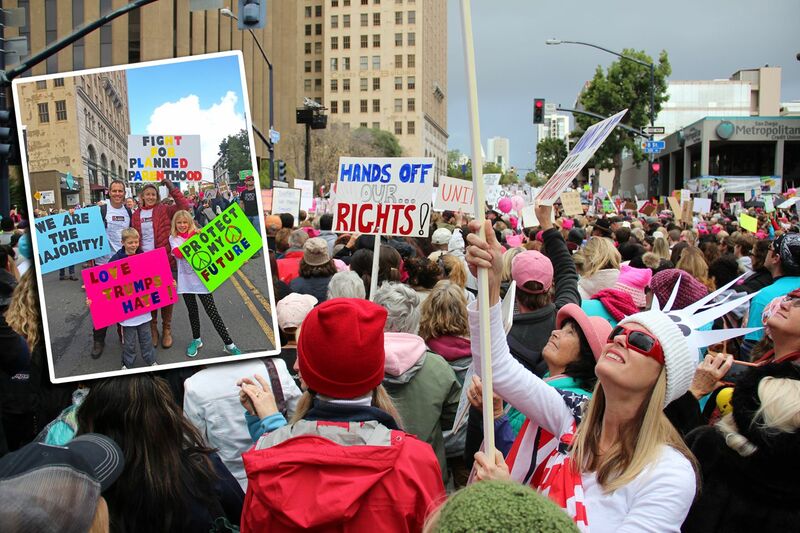 Our family joined 40,000 others at the Women’s March in San Diego Saturday to stand up for equality, liberty and women’s rights. I’m concerned that these American values will be taken away by leaders who undervalue the coming human suffering if proposed policy changes, like de-funding Planned Parenthood and eliminating the Affordable Care Act, are made. I marched for the future of our country, for my own kids and for the American democracy that I hold so dear. The passion and dedication of the marchers, holding thousands of home-made signs reflecting diverse images of inclusion, really affected me. Many, many of us fear what we see coming in this country. At marches across the country, we held space for the majority who believe it’s critical to speak out. The backside of my “Fight for Planned Parenthood” sign said “Still Stronger Together” and I truly believe that. 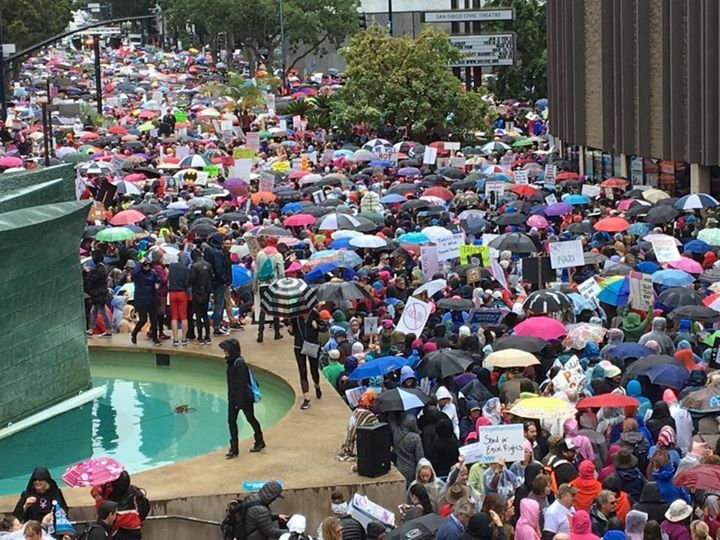 Here’s the San Diego Union-Tribune article about yesterday’s march. On January 25, 2017 at the City Council, we’ll be discussing planning in the rail corridor and hearing a report on the progress of the Coastal Mobility and Livability Working Group. If the rail corridor interests you – parking, walking, fencing, trails, crossings – this is a meeting to attend or watch from home. On February 1 at 6 p.m. we’re holding an informal, conversation-oriented City Council meeting at the Encinitas Community and Senior Center at 1140 Oakcrest Park Dr. Please note that it’s not at City Hall. We’ll be discussing a path forward on the state-required housing element. After the defeat of Measure T, the city still needs a compliant housing plan. We’re holding this meeting in a less formal venue and format so that we City Council Members can more easily engage with residents and hear your ideas and priorities before we make our next move. The City Council will need to decide where to direct our efforts and finances in the next round of developing a housing plan. What are the most important considerations to you? There’s a lot to talk about and I’m optimistic that we’ll have a highly engaged group focused on solutions.